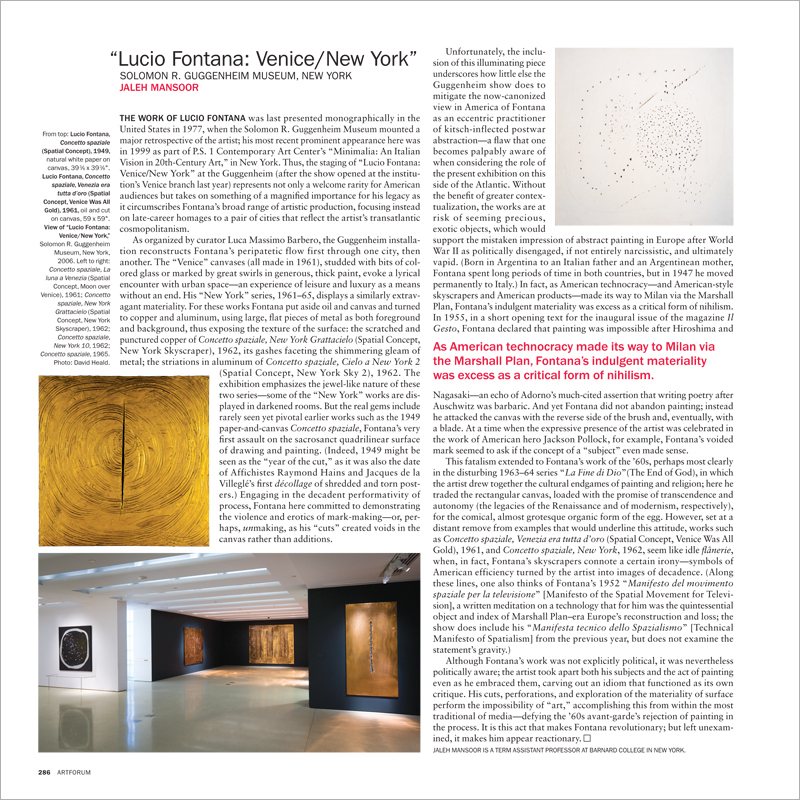 THE WORK OF LUCIO FONTANA was last presented monographically in the United States in 1977, when the Solomon R. Guggenheim Museum mounted a major retrospective of the artist; his most recent prominent appearance here was in 1999 as part of P.S. 1 Contemporary Art Center’s “Minimalia: An Italian Vision in 20th-Century Art,” in New York. Thus, the staging of “Lucio Fontana: Venice/New York” at the Guggenheim (after the show opened at the institution’s Venice branch last year) represents not only a welcome rarity for American audiences but takes on something of a magnified importance for his legacy as it circumscribes Fontana’s broad range of artistic production, focusing instead on late-career homages to a pair of cities that reflect the artist’s transatlantic cosmopolitanism. Order the PRINT EDITION of the February 2007 issue for $17 or the ONLINE EDITION for $5.99.